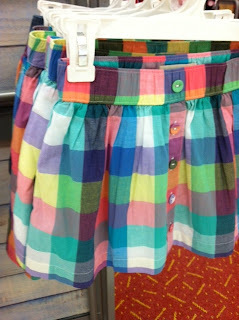 Spotted this skirt today while I was walking through a Big Box store. It brought me back to my middle school years when Madras was all the rage. This was one fabric that was supposed to bleed when it was washed, and boy, did it ever. It also turned into a total dishrag when it was wet. I can recall stylin', in my Madras shirt and white shorts, at Kennywood Park in Pittsburgh during our eighth grade picnic. I liked the plaids so much that my cafe curtains and bedspread were made of a plaid just like the one above even when I got older. Funny, but today I don't own anything plaid. Remember any of your own tales of Madras Days? Even though I talk about doing them every year, we did our first community walk on Sunday, and I was glad that our first one was such an inspiration. More than 30,000 -- and by some counts 40,000 -- people turned out on a nice spring Mother's Day to walk and run the Susan G. Komen Pittsburgh Race for the Cure for breast cancer awareness. We ended up walking a total of six miles rather than the 3.1 of the 5K, which included steps from the parking lot and around the exhibitions, but it went by painlessly. Since a cancer diagnosis can be so isolating, it was heartwarming to spend more time with so many others who had been touched in some way by breast cancer. There was definitely a party-atmosphere during the event, and this made it even more fun, as people remembered and celebrated. There were sad moments, too, when you could see an "in memory of" plaque on a young person's back, listing her Mom as her inspiration for entering the walk. My mother died almost 37 years ago of breast cancer. Those were early days, I remember, in the fight. I didn't wear her name on my pinney Sunday, but she was definitely on my mind most of the day and would have been thrilled to see so many people supporting the cause. Walking with a friend who is a survivor made me even happier. Here's to a cure for all cancers that take moms, dads, grandparents, sisters, brothers, aunts, uncles, friends away too soon.